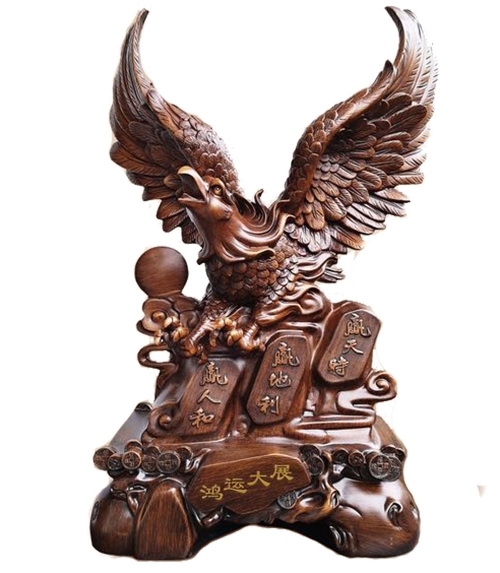 Overcome all your obstacles and fulfill all your goals with this brown Prosperity Eagle Statue ! The powerful wings and talons of the magnificent eagle will ensure strength and confidence for all your business, career, or personal goals. The eagle is the powerful ruler of the skies, and placing this statue in your home or workplace will arouse auspicious chi and positive aura. The base is covered in Chinese inscriptions of good fortune and a obstacle-free year. The big eagle figurine will help increase your concentration and resilience in all hindrances you may face. This gorgeous eagle statue will guarantee a year full of success and renewed ambition! The brown Prosperity Eagle Statue is not made out of wood, but designed to have an earthy appearance. It is made of polyresin. The dimension of this big eagle statue is approx. 12" x 7 x 21". It is heavy.